The total forest area in 2005 is just under 4 billion hectares, corresponding to an average of 0.62 ha per capita. But the area of forest is unevenly distributed. For example, 64 countries with a combined population of 2 billion have less than 0.1 ha of forest per capita. The ten most forest-rich countries account for two-thirds of the total forest area. Seven countries or territories have no forest at all, and an additional 57 have forest on less than 10 percent of their total land area. 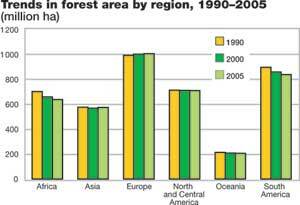 Africa and South America continued to have the largest net loss of forests. 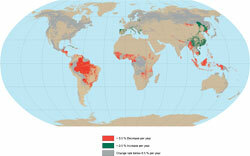 Oceania and North and Central America also had a net loss of forests. The forest area in Europe continued to expand, although at a slower rate. Asia, which had a net loss in the 1990s, reported a net gain of forests in the period 2000-2005, primarily due to large-scale afforestation reported by China.